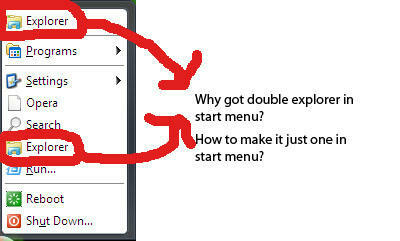 I curious how Explorer have two in start menu? How to make it single? Just left the below one. Maybe after i found the registry that make explorer double. 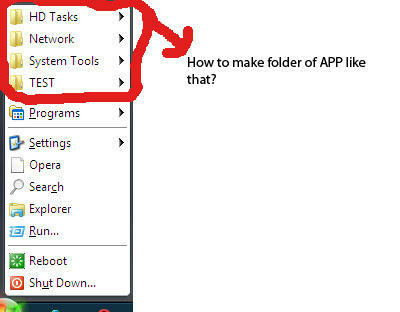 I want to transfer several folder in Programs just like the picture below. Search the help pages of WinBuilder and when you find the easiest way, post what you did. ok i will post what i did. each application makes calls to the Add_Shortcut API. It is this API (called in each and every script!) that is responsible for this. NOW, on the Win7PE_SE project, you might notice that these are translated into a data file that is processed at run time boot up of the PE. This is the file Win7PE.cfg in the Windows\system32 directory...@Michel - remember we talked about this when you had the issue with the "[" in the menu item name. So, more than likely, the explorer item is in the explorer script (not at the computer that has all my WB projects on it right now). It MIGHT (again, developer discretion) have a check box to enable or modify things. ALL the other scripts may have a text box to set the folder name. To make a shortcut in the "root" level, use a single period - (i.e. "." ) - for the folder. To make a sub-folder configuration (i.e. Apps\FOO) just use that - i.e. a PATH type construct. If you really wanted to HACK it, just build the project - WITHOUT the finalize scripts!!! Then go into the target area and modify the file. Then run just the finalize scripts (go one by one and run the little green arrowhead to run just that one script!. BUT, this is certainly NOT RECOMMENDED FOR NOOBS...i.e. leave this to the experts! For both of you, I would recommend just going script by script and changing the text fields...BUT, even then - BE CAREFUL...For a PE you use rarely (I hope), it may just be easier (AND BETTER) to leave this as is! NOT RECOMMENDED FOR NOOBS...i.e. leave this to the experts! Yup I'm NOOBS, because I'm just starting using the WinPE and my knowledge about it still 0.01%. Time by time, I hope i can better in using WinPE.